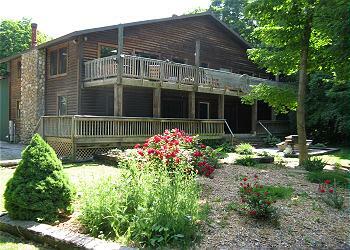 Set your clock to Island Time and enjoy the tranquility and natural splendor of Put-in-Bay at this wonderful duplex. A lovely wooded setting provides the backdrop for this vacation home rental which is located about a mile from downtown. This home sleeps up to 8 guests. Find time to reconnect with friends and family on the gem of the Northern Coast of Ohio. This unit can be rented in conjunction with the neighboring unit to accommodate up to 16 guests. This home features 2 bedrooms and 1 bath. Each bedroom contains two full beds and a sleeper sofa is provided the living room. The kitchen is equipped with the necessary items to cook and serve and scrumptious meal. A dining area can be utilized to join as a group to eat inside. If opting to dine outside, a wonderful wrap-around porch is available with seating. Also, a propane grill is provided to grill up your favorite summer foods. Catch an island breeze while spending time in the sizable yard. Bring your yard games and challenge your friends and families to some friendly competition. Parking is available for up to two vehicles per unit. This unit does NOT have wifi.